Okay, so we’re nearing the end of NaNo. You know, the month where you madly write 50,000 words in 30 days. I hope if you’ve been participating that you’ve succeeded already, or you’re mere words away from reaching the goal. Only a few more days! But today, I wanted to talk about that somewhat dreaded delete key. I teach typing, and my kids LOVE the delete key. I can’t get them to stop touching it! They don’t want any mistakes! If only writing were as easy, right? Anyway, I started NaNo with half a novel I’d written two years ago. Technically, that’s cheating for NaNo, but who’s going to turn me in? Is there a NaNo police? In this novel, I’d written about 40,000 words. I spent a couple days at the beginning at the month before I started writing. And let’s be honest here: It was a mess. But it’s a time travel novel, so I’m okay with a bit of mess in the first draft. But I struggled. And I mean, strug-gled to write more words. I think I wrote several thousand words in this broken draft. The problem? I didn’t know it was a broken draft. But after a conversation with my critique group, I decided I was brave enough to abandon that draft and start over. With a blank page. But I left that draft behind and I opened a new document. I started the book over, and I wrote 55,000 words in it. The book’s not done, but it’s a heckuva lot closer. And the most important part? So today’s tip is to embrace that delete key. Don’t be afraid to leave what isn’t working behind. Delete it. Cut it. Erase it. Abandon it. They’re just words, and you can write more. 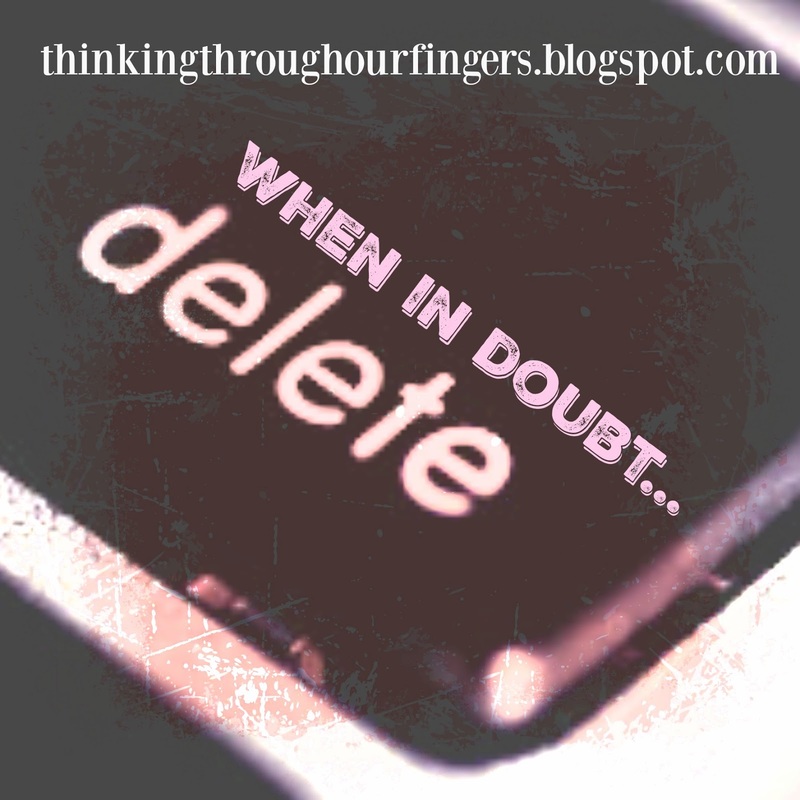 My motto: When in doubt, delete. Have you ever deleted scenes, chapters, entire novels and started over? How did it go? Liz Isaacson writes inspirational romance, usually set in Texas, or Wyoming, or anywhere else horses and cowboys exist. Her Western inspirational romance, SECOND CHANCE RANCH, is available now. The second book THIRD TIME’S THE CHARM comes out on Tuesday, December 1! I can so, so relate to this, Liz! I've been working on a manuscript since last fall, and it's the most difficult WIP I've ever written. I deleted it and started over this summer. and while I like it a lot (a LOT) better now, I've deleted and rewritten the beginning multiple times. Sometimes you have to. Thanks for the post. It's nice to know that I'm not alone! I love this. The book I'm querying now was at 40k when I realized it was wrong, wrong, WRONG!! Open new document and start again. And then there was a part where I switched to a different character – wrong again, but this time only because the setting was wrong. Deleted, rewrote and she came alive.